← YouTube, you’re bugging. No one is paying for your videos. Clap for your app. Applause gives app developers a helping hand. Do you want to know how your app stacks up against other apps? Or even previous versions of your own app? There’s a new app rating service called Applause, which lets you do just that. Applause is the brainchild of a Boston-based uTest (known for getting their tech on). 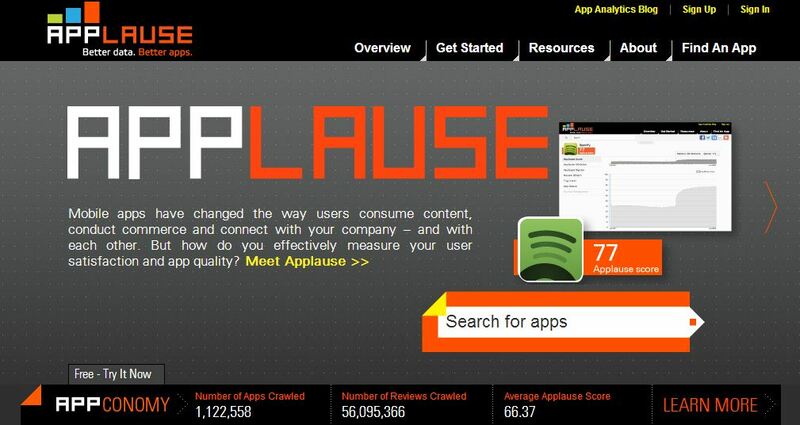 Applause is an app analytics product that crawls every rating and review from the top app stores. Applause synthesizes this mountain of user feedback into an easy-to-consume Applause Score to measure user satisfaction, app quality and how much applause an app is earning from users. Its been compared to Klout, the social media influence ranking service. But, in my opinion (outside of the 0-100 scale – more on that later) it’s actually more like Alexa, in that it ranks mobile applications far more objectively. Apps are given a score (like Klout) between 0 and 100. The greater the score, the better the app. Scores are tabulated from the more than 50 million ratings, reviews and comments left by users in the App and Google Play stores. 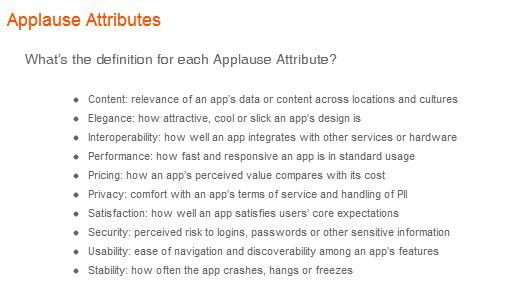 The Applause score is actually comprised of ten different attributes, which include things like price, content, usability and ‘elegance’. What are these “attributes” you speak of? If you want to get an in-depth understanding of how Applause Scores are generated, check out their Behind the Scenes page, which discusses how attributes are weighted and applied. For consumers, Applause can help you determine whether an app is worth the download. Too often, developers send ‘ringers’ in to artificially inflate an app’s star rating. Worse still, are the fake reviews of users lauding an app. Applause claims that it provides a more even-handed, objective review of an app. Kind of like the way Rotten Tomatoes provides objective, even-handed reviews of movies. I set up a free account and took Applause for a test spin, and was fairly impressed with what I saw. Setting up was as simple as entering an email address and choosing a password. From there, I searched for an app, double-clicked the result which opened up a dashboard. For developers, Applause provides a bright line test of their app’s true appeal. If your app wasn’t properly vetted or Beta tested, you might not know how crappy (or awesome) your app really is. Applause lets you see your app’s overall rating, but also a tag cloud of the keywords most often associated with the app. More importantly, Applause provides meaningful insight and direction about how to improve user satisfaction and overall app quality. If you’re curious, I’d definitely recommend that you check out your app and see if it generates any Applause. Woah. What an awesome service! I love it. Thanks for sharing! These posts are the main reason I am subscribed. Tech stuff all the way! Glad you found something useful here!